The Gang That Couldn’t Not Shoot, Straight: Game On! In 1987, as a bill that would require the state to issue handgun carry permits to citizens who were not explicitly barred from having them passed a vote in the Florida state legislature, state senator Ron Silver predicted blood in the streets, and said the state would turn into Dodge City. Silver, being a Democrat of some integrity, admitted several years later he was completely wrong, and that the law was an untrammeled success. In 2003, Senator Wes “Lying Sack of Garbage” Skoglund, during the debate on the Minnesota Personal Protection Act (which also instituted “Shall Issue”), said that the law would “allow gang members to get carry permits”. Which would, I suppose, be true, if you found a gang-banger who was 21 years old and had a clean criminal record, in which case the term you’d be look for is “citizen”. Anyway – it hasn’t happened. In 14 years, carry permittees have killed perhaps a half dozen people; in every case but one, it’s been ruled justifiable (and the one exception was someone who shouldn’t have gotten a permit to begin with). In sort, it wouldn’t be a gun control debate without someone claiming the sky would fall if the law-abiding citizen were able to exercise his or her rights – and a slow walk back five years later as the predictions turned out to be universally false. .
One wonders if she even realizes that the “OK Corral” analogy undercuts her point? It never, ever fails, does it? HF 188, which if enacted would allow any Minnesotan who is not prohibited from having firearms to carry a firearm without needing to pay for and carry a state permit. It’s based on the idea that law-abiding citizens shouldn’t have to pay for a state permit to exercise that right. HF 238, which would reform self-defense law by removing the arbitrary and subjective “duty to retreat” from the law on self-defense, as well as codifying the law-abiding citizen’s rights to defend their domicile and property. In response, “Protect” Minnesota – a group that has for over a decade provided comic relief to Minnesota’s Second Amendment debate – released a press release on the bills. They released it at 7:30 PM. On a Friday night. The time when most politicians in the know release damaging information – because it’ll be forgotten about by Monday. And they tried to make up for bad timing with pure volume; unlike most such political press releases, it’s as long as a a Madonna speech, and about as coherent. The piece isn’t just groaningly, flatulently long; it’s so full of falsehoods – through malice or through incompetence, it matters not – that it really leaves only two possibilities; they really are that badly informed, or they assume that the public is and want to help keep them that way. So tune in every day over lunch for something that “Protect” Minnesota won’t give you; facts. And the truth. This entry was posted in Lie First, Lie Always, Victim Disarmament and tagged Alternate Information - MN Edition, Rev. Nancy Nord Bence by Mitch Berg. Bookmark the permalink. Isn’t “threadbare cliche” itself a cliche? Not sure it’s used generally enough to make it a cliche, but hey, flying at 50,000 feet, it is what it is. Speaking of threadbare cliches and Madonna… Input “madonna just do it” into your Google Image Search (search result warning: NSFW for workplaces populated with the easily triggered and or regulated by the Demokratische Se*-Politik enlightened created over the last eight years). It’s a shame that our Democrat Party Dominated Media Culture doesn’t tell the story of Otis McDonald, the McDonald of McDonald vs. City of Chicago. 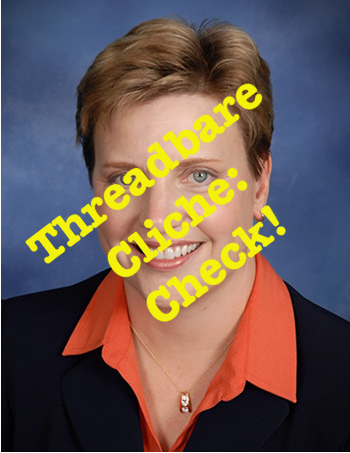 An image search on him produces someone who most certainly possesses neither ELCA hair nor the reality distortion field of the Reverend Nancy Nord Bence. Apparently, the Rev doesn’t subscribe to the Ten Commandments, specifically the 9th: “Though shalt not bear false witness against thy neighbor”, which with the lies she’s spouting, is precisely what she’s doing. Don’t even need to do that. Just go back to a Friday 1/13 post on this progressive, small yet regionally prominent blog. MBerg does “RS McCain – Rule 5” on SitD without my noticing. Haven’t the light rail trains killed more people than permit holders over the same period of time?